Adjustable heel height adapter for use with Talux and Variflex. The Quick Align allows for easy adjustment of the heel height of the foot for different footwear, with 8º of movement and 3cm of heel height adjustment available at the push of a button. How far and how long people can walk comfortably has always been dependent on the amount of energy they use. Vari-Flex means optimal energy efficiency and less pressure and fatigue. 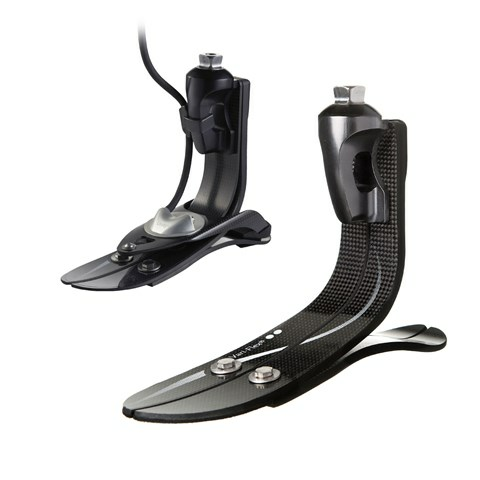 Ideal for most activity, Vari-Flex replicates the functions of the human foot beautifully. Its extra smooth roll-over motion contributes to a more natural, symmetrical gait, which means less fatigue and ultimately less strain on the lower back and sound side of the body. 8 out of 9 amputees who trialed the Vari-Flex said they preferred it to their previous foot. And 9 out of 10 reported a significant and positive difference when walking barefoot. "On a scale of 0-5, I'd give it a 6!" A big bonus for many people using this foot is the ease with which they can now walk barefoot. Most prosthetic feet are aligned for use with shoes, and removing them usually alters gait significantly. However in trials, users commented on improved stability in all types of situations, particularly when walking without shoes. People with all kinds of lifestyles / activity levels. Those who are looking for a smoother roll over and energy-efficient gait. People who weigh from 100-365lbs / 44-166kg. Made of specially layered carbon fiber for strength and functionality, the Vari-Flex is a lightweight, slender prosthetic that is easy to cover cosmetically. A durable, responsive foot, it has a split toe for enhanced stability. It is available in sizes 22-30cm and with a choice of beige or brown foot covers. A low profile Vari-Flex is also available for those with longer residual limbs. If you think the Vari-Flex could be right for you, discuss it as an option with your prosthetist.